Farmgirl Fare: Gift Idea: A Cornbread Lover's Kit for Under $25 & A Giveaway—Win a Signed Copy of The Cornbread Gospels by Crescent Dragonwagon! Gift Idea: A Cornbread Lover's Kit for Under $25 & A Giveaway—Win a Signed Copy of The Cornbread Gospels by Crescent Dragonwagon! Is Anything Better Than Cast Iron Skillet Cornbread? Give someone a hunk of cornbread and they eat for a day. Give them a cast iron skillet and a copy of The Cornbread Gospels and they'll eat for the rest of their life. Okay, enough dilly dallying around. I'm going to make a long and pathetic story short. Almost a year ago I received a review copy of The Cornbread Gospels by Crescent Dragonwagon. I tried recipes, took photos, happily ate hunks of warm cornbread with honey and tall glasses of cold milk for breakfast for days on end, fell in love with this wonderful book, started wishing I lived next door to Crescent because her stories kept making me laugh out loud—and never got around to telling you about any of it. Shame on me. It pains me to think of all the scrumptious cornbread you and your loved ones could have been devouring during the past year if I'd been more on the ball. Not to mention all the fun you could have been having learning tons of stuff about cornbread and getting to know Crescent (who adores cornbread so much she spent six years working on this book). So let's forget the 'proper' review this book deserves and the recipes I've been meaning to share, and just cut to the chase. 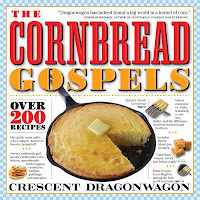 I love The Cornbread Gospels and am giving away a copy signed by Crescent Dragonwagon to one lucky Farmgirl Fare reader. * To enter, leave a comment in this post telling us something (anything!) about cornbread—a favorite family recipe, what kind of cornbread you like, how you like to eat it, your first cornbread memory, a funny cornbread story, or simply why you want to win a copy of this book. One entry per person, please. I moderate comments, so if I'm away from the computer it may be several hours before yours actually appears. If your comment doesn't show up right away, there's no need to leave another one. You can enter through next Wednesday, December 17th, and I'll choose and announce a random winner on Thursday, December 18th. Please check back to see if you've won, especially if I have no way to get a hold of you (for example, if you have a blogger profile, is it public and does it list your correct e-mail address?). If I don't hear from you by Monday, December 22nd I'll have to pick another winner. Sorry, but this prize can only be shipped to a U.S. address. Good luck! I can't wait to read all your cornbread comments. And in the meantime, if you're flailing around looking for a practical and delicious gift to give the food lovers on your list, consider buying them a cornbread kit. It will last forever and set you back less than 25 bucks. Simply place a copy of The Cornbread Gospels in a 10-inch cast iron skillet (which of course has a million other uses) and tie a big red bow around it. Done! If you want to go all out, you could include a pretty package of organic cornmeal and a jar of local honey. *Monday update: My apologies for any confusion—the giveaway is for a signed copy of The Cornbread Gospels. The cornbread 'kit' is a fun gift idea I just tossed out as a suggestion. © Copyright 2008 FarmgirlFare.com, the award-winning blog where things are always better when there's a pan of homemade cornbread around. oh wow, I love Crescent Dragonwagon! I used to be the designated cornbread maker in our house as a kid, and I liked to double the sugar and put some vanilla in it to sweeten it up. Our family inhales cornbread when I remember to make it....my favorite way to eat it is with butter and honey. 1 cup dried cranberries, simmered in water to plump them up. 1-2 cups regular bread crumbs, very dry and very fine. 1 T herbs de Provence (optional). Or you could use sage, thyme, poultry seasoning, etc. 2. Cook the celery and onion in the same skillet with the stick of butter. You could drain the fat/grease from the skillet OR cook the celery and onion in the dripping from the sausage. Sautee celery and onion until soft. Try not to brown the vegetables or butter. 3. Simmer cranberries to hydrate, if necessary. Drain of liquid and set aside with sausage. 5. Grease a large glass casserole dish, and spread dressing in the dish. 6. Bake at 350 degrees for about 45 minutes, or until set. Guess I could really use a GOOD recipe book. Although I grew up in OC California, my dad is from Tenn. and was the cornbread maker. He used white cornmeal and the cornbread was not sweet. We would eat leftover cornbread this way: Crumple cornbread until it almost fills a tall glass. Add milk, salt, and pepper. Eat with a long spoon. Yumsters! We're a family of cornbread fanatics. There is no 12 step program to help us with our obsession. We eat cornbread cakes, hoe cakes (fried cornbread) for breakfast, we've cut up hot dogs in our cornbread muffins to make "corndogs", we'll eat it with honey, with maple syrup, crumbled up in chili, baked on top of chili. We've crumbled it up and made stuffing. We've crushed it to bread fish. We like it sweet, we like it savory, in a pinch (she shamefacedly admits) we'll pick up Jiffy Mix. Oh, but that's few and far between because homemade is so where it's at. We've made it with cheese, with corn, with peppers. We've made it with raw sugar and once with my dad's honey. We've made it with made it with my brother's homemade, yes from a tree, maple syrup. We'd savor every page, literally. Thanks for the contest. And a cast iron skillet to boot? You must know that our prize one was stolen from our cabin recently and we miss it dearly! My name is Donna and my favorite 10inch cast iron skillet is the one my grandma taught me to make corn bread in! I also love Crescent's books. Right now, with the hubby laid off, I'm not buying any, but I can sure try winning one! Cornbread, buttered nicely, with bean soup -- now that's comfort food! Cornbread is an old favorite in my family. We tease my mom about her famous black-bottomed cornbread. It's not that she isn't a good cook. She's just a distracted cook. She would always forget about it until the bottom burned. We'd just peel off the black and eat the rest - with honey! My husband is into dutch oven and cast iron cooking. I've ALWAYS made the corn bread in a cast iron sillet. He decided he was going to make it in a dutch oven over an open fire. I kept telling him to take it off the fire, but needless to say, he didn't and it burned. Everyone said, you should have listened to me. Well, we were at the back of the farm camping and he sent me into town for more. I bought 6 boxes, just in case. Well he burnt everyone. The last batch was't too bad so he cut off the burnt and we ate it anyway. I guess a little is better than none. But now when we camp, I'm in charge of the cornbread! HA! My mother and I lived with my grandparents from the time I was five until I left for nursing school. I watched her make cornbread every day of the year. I hope some of her cornbread skills rubbed off on me. I love cornbread best with summer veggies, as fresh corn, green beans, and black eyed peas. I also love it with vegetable soup, yum! Love cornbread! our family favorite is to make a batch of chili in our cast iron skillet and then drop blobs of cornbread batter on top, slide it into the oven and in 20 minutes we're set. We're making cornbread tomorrow morning for a Sunday potluck with chili. I love Mexican cornbread the best, but I'm not sure yet what kind we'll end up taking. I would love to win the book. I love cornbread! Count me in! Okay, I need to win the cookbook because....I make cornbread from a box - yes, it's true - however it's Krusteaz and it seems to be good. but apparently, I could be doing better, plus, I cried when I read Crescent's book The Passionate Vegetarian when she tells about her husband and...then on to hundreds of pages of terrific stories and recipes for veggies like me. What a writer! Anyway, I do enjoy your blog, most especially the donkeys and the beagles!! I adore cornbread made in a cast-iron skillet. I have a wonderful recipe that always comes out with a glorious crunchy bottom crust, but also have a weakness for a spicy recipe with cheddar cheese and peppers. My favorite is slightly, very slightly sweet, simple cornbread with butter. I am new to cornbread but I love it with chili, or beans, or really anything. I am still wavering between sweet and not-sweet. I will definitely have to try it with honey!! by far, my favorite recipe for cornbread comes from peter reinhart's the bread baker's apprentice. i add crumbled bacon on top and use the rendered bacon fat to coat the bottom of the pan. Whoa...here come the sweet memories...Yummy cornbread sitcks made of Weisenberger corn meal, baked in generational seasoned cast iron cornbread muffin pans shaped like ears of corn and served with real butter--by my Grandmama Dorroh. I have some Wiesenberger cornmeal in my own California pantry thanks to Debbie, my Kentucky cousin who sent me home with some on our last visit back. I have only recently discovered that cornbread is not just a dry yellow hunk of overly sweet filler. A few years ago, my housemate made some habanero cornbread with honey from scratch. It made my mouth burn, but it was amazingly moist and delicious. I feel like I've been missing out all these years on wonderful cornbread! I've always liked cornbread, but recently I baked some in my cast iron skillet for the first time and totally fell in love with it all over again. It was the best ever and I am now sold on cast iron skillet cooking. I like cornbread best hot out of the oven with real butter on it. I grew up in an unheated house that my granpa built. There was a double-decker electric oven in the kitchen, and I would sit there to keep warm when mom cooked cornbread. We had not one but two cast iron skillets: one for cornbread, and one for other things. Mom's cornbread wasn't great. In retrospect, I understand why. For some reason, she used Parkay my whole youth. Cornbread demands butter. Real butter from real cows. I'm growing blue corn this year, a Cherokee Squaw dent corn. I look forward to making blue grits and blue cornbread. My fried green tomatoes are gonna look funny in blue, too! Growing up in Paris, I never tasted cornbread until we moved to the US thirty years ago and it was love at first bite! I'm a cast iron skillet, savory cornbread kind of a guy. My family loves cornbread but my baking cornbread skills are limited. It would be a treat to be able to expand my knowledge of additional cornbread recipes to please a group of hard working farmers. Winning this cookbook would be like finding an oasis of summer in wintery Maine - we're covered in ice and the thought of a warm skillet of cornbread smothered in butter and honey is heavenly. I'm a transplanted southerner who misses good cornbread-these Yankees just don't get the love affair. Even if I don't win I'm tracking down this cookbook! My mother is the cornbread maker in the family. No holiday dinner would be complete without her cornbread dressing. Mmmm. Cornbread. I love it. My kids love it. My DH? not so much. The only way he likes it, is if I add a can of creamed corn to it. We do "northern" style cornbread, with a little sugar in it. I also love cornbread muffins with blueberries in them. SOmething about that flavor combination slathered in butter makes me drool. . . I copied out a recipe I'd like to trythat I haven't yet, that adds bits of crispy cooked bacon. I think that might be good too. Mmmm....cornbread! I recently made a large batch of vegan blueberry cornbread muffins for sister to have on hand for snacks. She loved them. She LOVES corn bread, corn muffins...... At the time she had morning sickness and little motivation to cook and that has thankfully passed - could it be the cornbread?! I can't believe I do not already have this book! I love cornbread. My mom always had those silly cast iron cornbread tins that are shaped like ears of corn, and nothing is more delicious that the cornbread that comes out of one of those, well buttered of course. The secret is to put the tins in a cold oven with a pat of butter in each. Then pre-heat the oven, the tins, and grease them all at once, just drop the corn bread batter directly over the central mass of melted butter and it's perfect. Easy to burn yourself though, just a sacrifice we have to make for delicious cornbread. Early cornbread memory. Going out to he feed room of the barn with my Great Aunt with a sifter to get some freshly ground cornmeal. She just took a scoop and ran it through the sifter to get something fine enough to use. Except for the flour and baking powder purchased from the store everything else in it was from the farm, milk, butter, egg, maple syrup and corn meal. Hot out of the oven split it open and spread butter and dosed in maple syrup, yummy! Cornbread - usually from a box (Krusteaz)I'm sorry to say. I have a lot to learn. I know my MIL made it in a skillet and I've heard she added sugar and mayo. I could definitely use the book. thank you. I love corn bread made with Ancho chili powder, cheddar cheese, and sweet corn kernels for a savory twist. Corn bread is good...especially with lots of butter! I would love a new cookbook. A cookbook is always welcome in my house! I can't control myself around cornbread. Especially warm with butter and honey. Yum. One of my fondest memories of my dearest uncle is of him making cornbread in a skillet just like the one in your picture. His cornbread was absolutely the best. I can never eat cornbread without thinking about him. He hiked the whole of the Appallachian Trail, about 30 years ago, fueled largely by cornbread. Please include me in the drawing, and thanks! Cornbread fresh and piping hot from the oven - drenched in butter is the perfect side to any hearty meal. Something new I started doing in past couple of years is adding crumbled cold cornbread to a chopped salad with avocado, green chilis, lettuce, onion, tomato and olives - making a taco salad with real oomph! My family always requests "the real cornbread recipe" whenever I try a different recipe. "The real cornbread recipe" comes from America's Best Recipes, State Fair Blue Ribbon Winners, (c)1983! When I open the book it automatically opens to the Old-Fashioned Corn Bread recipe. I love cornbread. My husband loves to eat it with pulled pork and fried pickles. He's not from the South but he did go to college in south! My favorite cornbread recipe has cornmeal and fresh corn in it too. Yummy! Funny story...years ago when I was 12 I set out to make cornbread in my mom's castiron skillet. I mixed, pored and baked. When it came out it was beautiful! I was so proud and showed my dad who was the cornbread expert in the family. We cut it up, still warm and I took a bite only to be very disapointed. It tasted terrible. So dad back tracked the recipe with me. He said show me the baking powder you used. Sure I said showing him the box of arm and hammer baking SODA!Oy! My dad bakes cornbread over an open fire in his dutch oven. Few things taste better...well except for the homemade blueberry cobbler he makes the same way. There's little better this time of year than a hearty soup and cornbread, served with local butter and our own honey. Its important to have enough leftover cornbread for breakfast in the morning too. There might be fancy restaurant food in the city, but here on the farm we like it hot, hearty and simple. The secret to my mom's thanksgiving dressing is the homemade cornbread in it. My family and I love the cornbread dressing so much we never consider anything else. First of all, I would treasure any book written by someone named Crescent Dragonwagon. Secondly, I am still searching for the perfect cornbread recipe. Perhaps it's in this book. Do you have Cornbread: A Love Story with Recipes by Jeremy Jackson? The Popcorn Loaf (made with popcorn flour) is amazing. Fantastic, a book with recipes on just Cornbread! I would love to try these yummy dishes. I cook alot of pastas and chilis with my homegrown tomatoes. Cornbread would go great with these. You mean there is good cornbread out there! I've only had it from a box mix. I'd love to give it a try. I grew up without cornbread. I have had it several times as an adult, and only once did I like it - at a Cajun restaurant. Obviously it makes a great deal of difference on how it tastes on two important things - ingredients/method, and who does the cooking! I would be delighted to win this cookbook and make myself a believer! As a black woman from Detroit, there was always cornbread around. Mom from Alabama and all the neighbor ladies from other Southern states. My mom made cornbread all the time, as did all our friends moms. I know I took it for granted that this wonderful food would always be available and I never really learned to make it. Every year around this time, I start trying my hand at different cornbread recipes hoping for the right one, the one that was most like Winnie's, (my mom) which according to her wasn't as good as Bessie's (her mom). Each time, I end up unsatisfied and feeling just a little insufficient. I know that I'll start again in a couple of days and this year, I know it's going to work. I love the Marie Callendars cornbread so I try to make something like it when I make it at home. Then of course you have to pile on the butter and honey! I love good cornbead and I love Crescent Dragonwagon! In the past few years my cornbread-making has grown more experimental so a copy of this book would be perfect. I'm from the South, so NO sugar in corn bread for me - and I've lived on cornbread (made with buttermilk)from a cast iron skillet for many long years!! It goes so well with so many things. And leftover corn bread crumbled into a glass of buttermilk is a whole meal!! I hadn't heard about the cookbook, but it sure looks interesting! I love cornbread, but I haven't figured it out completely yet - I am always trying different recipes. I like it moist and savory, to go with soups and chili. Last night I made some to soak up the gravy from the pot roast. I started raising bees this spring and I planning on adding toasted cornbread with honey to the breakfast menu here at "the urban farm". I have just discovered the joys of cast iron and corn bread. I would love to win this! Growing up, the only cornbread that I ever tasted was the stuff that the school cafeteria served. UGH!!! So for years, I totally avoided it, until not to long ago, when I had it by mistake. It was served with a meal at a party we went to, and I totally fell in love! Since then, I've been making it at home, but still haven't found that OMG recipe that I know is out there. Maybe this book contains that recipe :) Thanks for the contest! I love cornbread - my mother is from Tennessee and we grew up eating it. Potato soup, cornbread, deviled eggs and a plate of garden veg like radishes, sliced tomatoes, cucumber and green onions is a fine summer supper. My mom still makes cornbread for the turkey stuffing every year. It's the best. I have always loved cornbread, but I entered a new world of cornbread when I started making it with strawberry yogurt instead of milks or sourcream. You won't know if you are eating cornbread or dessert and the yogurt makes it moister than anything else! I love it! I'm not a huge fan of cornbread...but maybe I would be if my wife found a new recipe! I love cornbread! I serve it every time I make chili. I like my cornbread sweet. I have an infant and to prepare for the busy days with a baby I stocked my freezer with extra cornbread. It has been so nice to just warm it up and eat it on days when I am too busy (or tired) to cook. Cornbread and I have not exactly become friends. I thought my grandmother, a farm wife, would have a great recipe, although I didn't remember eating it as a child. I made it one night and realized it was dry and tasteless! My father confirmed that his mother's cornbread was never that good. So, I really need some better recipes! Thanks so much for offering this cookbook! I would love to try some of these cornbread recipes. I found your blog when looking for recipes for pita bread for my husband who is going to try his hand at baking for the first time in his 46 year old (as of 12/12!) life. He got laid off the Tuesday before Thanksgiving, so this is some much needed cheer. THanks for the great stories and the chance to win what sounds like a super cookbook! My husband didn't like cornbread when I met him, so I set out to create a recipe he would love. Mission accomplished! I start with diced bacon in a cast iron skillet placed in the oven as it pre-heats. Pouring the batter into the very hot bacon grease creats a crispy/salty/smoky crust that is so yummy! The recipe results in a sweet and moist cornbread, almost like a cake but still real cornbread. Favorite toppings are butter and either raw honey or homemade spicy apple butter! However, I would love to try new cornbread recipes and discover a new author. Corn bread and brown (pinto) beans...doesn't get much better than that or much simpler. Would like to learn how to make the cornbread in a cast iron skillet though, I bet it would taste wonderful. I don't have any good tips on how to make awesome cornbread (maybe that's why I need the Gospels!) but I have learned that just about any cornbread is delicious warm out of the oven with soft butter and generous drizzles of honey. I have to echo the cries the restaurant patrons in the book: "I love cornbread!" It looks like a great book. My uncle moved in with my family earlier this year from Texas. One day I wanted to make cornbread for him, but, what do you know, we were short on cornmeal. So I threw some popcorn kernels into our regular blender and ground them into a coarse flour--parts of it about the consistency of polenta, some finer. The substitution worked, and my uncle still requests "cornbread with popcorn." My best friend makes the best cornbread stuffed pork chops. Just thinking about them makes me hungry. I would love to get this book and be able to make her something similarly wonderful in return. i love corn muffins - especially warm from the oven w/ some butter. or w/ some fresh blueberries in them. it is one of the first things i learned how to make. i haven't ever made corn bread in a cast iron skillet - it is something that i will have to try. I'll tell you my cornbread secret: I am from the south, and I like... sweet cornbread! I get shunned when I say this locally of course, since everyone says that sweet cornbread is yankee cornbread. My cornbread story... well for a few years when I was in college, I would make Jiffy cornbread to feel like I was having something homemade. It was super inexpensive, easy, baked quickly, and was highly portable for grabbing a bit and heading to class. I think that cookbook might help me expand my cornbread horizons! Mmm...cornbread! We love cornbread, right now in leftover stuffing form; but also in muffins, pans, loaves, and pudgie pie makers. A far cry from my first hard, stale taste of it in the school lunch program at school! As I didn't grow up eating cornbread (being that I was born and raised in Marlow, England and lived there for 30 years. )I have learned to enjoy it now as we have been living in Raleigh, NC for the past few years. Cooking it in an old dutch oven has worked well so far. Maybe it's time to purchase a cast iron pan and the cookbook sounds like the way to go. Great idea for a gift also. MAny thanks. I'm not kidding - I have several cornbread memories. My dad used to eat cornbread in a bowl with buttermilk. Now, we both eat it with butter and honey. Yum! My grandmother, Bibby, use to make the BEST cornbread. She made it in this beat up well seasoned pan. Everyone wanted that pan when Bibby passed. BUT, Bibby promised the pan to my cousin Dana. It is still getting a lot of use to this day and still makes THE BEST cornbread. Yes, I was raised in the South. And, yes, we love our cornbread dressing during the holidays. The recipe I've posted is not my great-grandmother's. Bobby (Maude Shaffer) never used recipes. I don't remember too well, but I've been told she was a fabulous cook. This recipe for cornbread dressing came from Mrs. Palmier in Meridian, Tx. It's pretty close to what Bobby used to make. Enjoy! *You don't have to measure carefully! Saute onion and celery in butter. I salt and pepper to taste. Mix all bread and veggies together then add turkey drippings or chicken broth. Add the cream of celery and cream of chicken soups. Add enough HOT water w/melted butter to make the mixture sloppy. Season to taste with salt, pepper, and sage. Beat 6 eggs and add to dressing. The only way I like lima beans is when my mom cooks them with butter and then bakes them under cornbread. Yum. :) But when I went to duplicate it in my own kitchen, I discovered the box of Jiffy mix was not as moist and tasty as I'd like, so I'd enjoy this cookbook! I keep trying recipes for sweet potato cornbread. Apparently, I love the concept. But the rest of my family doesn't love it. The experimental leftovers always make fabulous cornbread pudding, though! I like jalapenos in my cornbread. I like it with chili. I introduced cornbread to my wife and we could definitely use a nice skillet in which to make it. Growing up, my mom always made cornbread from scratch to go with chili. I never really liked chili as a child (I've outgrown the dislike) but I loved chili nights because of the cornbread. My first two years in college my boyfriend and I went to the same cajun restaurant time after time. Their entres weren't very good, but the cornbread was so amazing we couldn't stop going. My senior year of college my roommate's boyfriend discovered the jiffy cornbread mixes, and cornbread became a staple of our diet. It was his solution to any problem. Relationship troubles- cornbread muffins, late night studying- cornbread, parties- cornbread with lots of butter and honey. It wasn't as good as my mom's homemade kind, but they got married and moved away last year and I still make it every once in a while out of nostalgia. To me cornbread is only surpass by chicken and homemade noodles as the ultimate comfort food. It reminds me of everything great about my life. I like cornbread with lots of cheese, but my Dad is the cornbread king. This would be the perfect gift for him. Thanks for all of the great blogs and Christmas ideas. Could anything be better than cornbread and collards? I LOVE cornbread and hunny butter, warm and just dripping...All the other comments sound yummy too! I LOVE cornbread. My Mom used to make it in the cast iron skillet when we were kids. I never told her but I always liked my step-mom's version better because it was sweeter. Come to find out it came out of the Jiffy Mix box!! :) Anytime I make a big old pot of Chili we have to have cornbread. For dessert ... warmed cornbread with melty butter and honey .. YUM YUM!!! I love my family's cornbread dressing at Thanksgiving and Christmas. It has a ton of butter in it. Cornbread is the best... well, at least when you make it as cornmeal pancakes... with lots of syrup! Yum. ;0) That being said, I'd love to explore all the different cornbreads out there! The hubby and I love having cornbread with our meals. It's fast, easy and cheap to whip up, especially if we are having a main course soup. Yeast bread is wonderful but not spontaneous. Cornbread is good anytime. The South adores cornbread. Cornbread is served hot or cold, for breakfast, lunch, or dinner. Often cornbread is a meal all by itself, and in Tennessee you can’t spell cornbread without buttermilk. Buttermilk is both a required ingredient in cornbread and the beverage of choice to accompany cornbread. I made my first pan of cornbread twenty eight years ago using a recipe provided by a friend ,a fellow furniture saleswoman. My friend assured me that her cornbread recipe was “the best”. The cornbread was a “culinary tease” a flirtatious gesture meant to “wow” my soon to be husband, Earl Cruze, an East Tennessee dairy farmer and a “southern cornbread” aficionado. 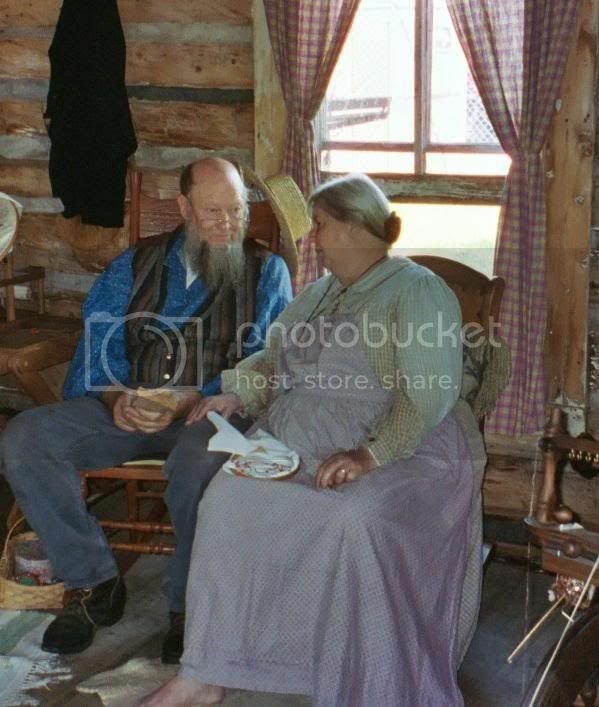 According to Earl, her recipe was far from ”the best”, in fact it was sweeeeet, cakey textured, lacking buttermilk, and tasting “nothing” like his Mother’s crisp slightly greasy cornbread. As far as he was concerned, my cornbread was simply not edible. We married in spite of his harsh assessment. Twenty eight years later I can make a skillet of cornbread as good as his mother’s, and he is an award winning buttermilk maker. We make a good team. Preheat the oven to 400 degrees. Place 3/8 inch of grease (bacon drippings) in the bottom of a well seasoned cast iron skillet. Preheat the skillet for 5 minutes. Combine cornmeal mix, butter, and buttermilk, stir. Carefully pour the batter into the hot greased cast iron skillet. Bake the cornbread at 400 degrees until it is dark and crusty on the outside. When done, remove the cornbread from oven, let it rest five minutes. Flip cornbread onto a flat plate, crust side up. Serve alone or with a meal. I like to cut a pie shaped piece for myself, but my husband likes to break off chunks of crust and leave the tender inside for later snacking. Of course I serve my cornbread with ice cold real churned buttermilk. For many of our buttermilk customers their fondness for buttermilk began with an evening ritual of cornbread and buttermilk. Cold leftover cornbread was broken into a glass of buttermilk and eaten with a spoon-soup style. This is still a great refreshment. Try it. Now here’s the deal, if I win your contest for The Cornbread Gospel you win too!!! I will send you a half gallon of our delicious real churned buttermilk and a copy of the documentary film Buttermilk, It Can Help. The film by Joe York is about my husband and his award winning churned buttermilk. The film was commissioned this year by the Southern Foodways Alliance located in Oxford, Mississippi. Annually the SFA honors “Keepers of the Flame” of southern cooking. This year my husband’s buttermilk received the award. At the celebration breakfast our buttermilk was served along with the famous grilled “crackling corncakes” made famous by the expert county cooks at The Old Country Store in Jackson, Tennessee. Thanks for the cornbread contest and welcome to the world of Tennessee “buttermilk cornbread.” I can’t wait to read the Cornbread Gospels. Check out the SFA website for much more info about Southern food and culture. Green chile cornbread, straight from the oven, with honey butter...the best wintertime breakfast, hands down! Ok...I'm game....when we were little my mother (being the lovely little European farmgirl that she is), used to make straight cornbread, but add VEGGIES (waaay interesting) pieces into the mix with a little paprika (it's an Eastern European thing, I tell ya!) and then pour the whole bit into those old cast iron pans that are shaped like little corn on the cobs. They were suprisingly delicious! Cornbread often seems a bit on the dry side to me. Is there anything I can do to moisten it up?? My favorite cornbread is "Jiffy" mix. I never make it from scratch! I would love to win this book! Marcia in Wyoming...I usually fix cornbread with homegrown, home-ground cornmeal in a cast iron skillet to accompany elk chili - great combination. There is nothing like a good cornbread in a cast iron skillet. It reminds me always of my mother... and it reminds her of hers... and her of hers. Who knows how far back these traditions go. It is also the only bread that I could sit down, stand up, whatever... and eat the whole thing and not feel guilty about not sharing. :) Happy Holidays everyone! I remember when I was in Girl Scouts (during the early 70's) we were learning about pioneers and that they baked from memory adn trial & error, not usually recipe cards. We were given the task to "make up " our own cornbread recipe. I recall that mine looked and tasted like yellow concrete. Still to this day, I think of that when ever I make cornbread (usually from a box). I would so put an actually book to good use. Cornbread that is gluten free was one of my earliest successes in alternative baking. I use my grandmothers century-old cast-iron skillet and it is perfection! I haven't gotten adventuresome so perhaps I need a push with Crescent's cookbook. My husband and I agree on most things, but he's very much into savory cornbread and I like the sweet kind. Perhaps a cookbook would let us reach a compromise? While I have always eaten cornbread (I am Southern after all) it is just in the past year or so that I have developed a real respect and affection for it. My mom clued me in to Three Rivers brand of cornmeal mix and now that is the only kind I buy. My other obsession is Mexican cornbread with green chilies, creamed corn, onion, hot chile peppers, and cheese. I consider it a vegetable side dish. Warm cornbread crumbled in a glass of cold milk eaten after dinner for dessert - yum! Cute gift idea! I shouldn't admit this, but my favorite cornbread is from the little blue and white Jiffy box. Maybe if I read the Cornbread Gospels, I could branch out and find a new love. I adore cornbread with chili! And I'd love to win the Cornbread Lover's Kit. I love cornbread and have found that my new favorite ingredients is...bacon grease!!! Chili is just not right without cornbread! Just made homemade cornbread over the weekend to have with pork and pinto bean chili. I love folding some sautéed onions and peppers in the batter before baking. Adds great flavor and texture. Crescent's books are fantastic! What a great giveaway. Growing up in the midwest even, we did not eat cornbread do to the fact that my mom had not so fond memories of eating it daily as a child, it's the poorman's bread. So when I left home and discover cornbread with pepers or soaked in milk and honey (for afterdinner snack) I loved it. Plus finding out how to make it from "scratch". oh and how it gets crisper in a cast iron skillet instead of a pan. Not to say I was deprived as a child my mom makes the absolute best pies and coffecake, I mean REALLY. She is German desent. When I was a little girl, my step-dad loved to make collards with cornbread...or chili with cornbread...or basically anything with cornbread. So when I got married I started making my own cornbread, to which my new husband said "what the hell is that!" I had no idea that there were people on the earth who had never had cornbread. It took him some getting used to, and it's still not his favorite, but i love it!! And he can eat it or he can starve, the choice is entirely up to him. OK, cornbread. . . I just recently made a new to me recipe from my Fannie Farmer cookbook sweetened entirely with honey, and it was delicious. Down South my husband learned how to spit seeds and eat cornbread from his Grandpa. Grampa S was a real cowboy -- he was on the very last cattle drive before the whole country went feedlot. To eat cornbread like Grampa S did every morning, get yourself a glass of cold milk and crumble the cornbread into it. Eat with a spoon. For some reason, that makes the cornbread sweeter. Must be the kick of loving history behind it. My grandma was from Kentucky and we often had soup beans with skillet cornbread. I'm not the greatest cook, so my beans get sopped up with Jiffy cornbread. I'd love to win the cornbread cookbook to expand my horizons. And if I am so lucky to win, I will buy a cast-iron skillet, so I can do it up right! My grandmother left me her 60 year-old cast iron skillet (much to my father's dismay, he didn't get it) but I have yet to find a cornbread recipe as heavenly as hers (which, incidentally, she took with her to heaven). I love warm cornbread with butter and peaches on cold mornings for breakfast. So I'll keep my fingers crossed that I win the book! My Mom used to make the most amazing cornbread dish for breakfast when we were out camping. She'd put bacon and pinapple rings in her favorite cast iron skillet and pour the cornbread batter over the top. It always tasted as good as it smelled and could get me out of my sleeping bag and into the cold Rocky Mountain morning air faster than anything else ever could. Growing up, my dad would make the best cornbread, in some cast iron molds shaped like small ears of corn. I loved that these shapes had an abundance of crust, and were small enough to be eaten by hand. One of the things that I have more recently been introduced to is sweet cornbread. While I think they are good, I still have a soft spot in my heart for a nice savory cornbread along side a big bowl og beans. Thanks for reminding me that it is perfect weather for cornbread, I'm going to have to make a batch soon. If given a choice of my last meal, it would be red beans, pan fried potatoes, slices of onion and hot cornbread. I would crumble the cornbread on top of the beans and cover it with just a little more bean "juice." If there was cornbread leftover, I would crumble it in a cold glass of buttermilk and eat it with a spoon. It's a cold day in my backyard. I guess it's time to get up, turn on the oven and reach for that iron skillet. I have to say my family is a big fan of Jiffy cornbread mix, though I also like to make it from scratch. Our favorite is cornbread pancakes; they are a specialty of my dad's and anytime I visit he makes them for me. I also love cornbread muffins and eat tons of them in the winter with soups and stews, especially chili of course! My mohther made cornbread in a square pan and we ate it with lots of butter. I'm excited to try my new cast iron pan to make some myself! I love Crescent's cookbook, The Passionate Vegetarian. I use it all the time and enjoy reading the stories and comments abut as much as the recipes. I always make cornbread to go with chili when the weather turns cool. I use a fairly basic recipe but always add corn kernels. My grandma made it in a cast iron skillet, and my mom used to make it in the iron pan so it was shaped like ears of corn. We loved that as kids. Thanks either way for the giveaways. Either way they are always very insightful and gives great ideas for other gifts! I would love to win this book! I am a home baker and have only ever made corn muffins once, but they were so good that I decided I had to find a great skillet cornbread recipe. (For the muffins, I used the recipe in my very old edition of the Joy of Cooking.) My husband is a devotee of the cast-iron skillet for all kinds of cooking, and I think it would be fun to be able to use his favorite pan to bake something for him. I love cornbread, especially with chili, but have never really found a recipe that works for me. I love cornbread stuffing, corn cakes, and cheesy cornbread. My kids like it very sweet with honey. I have enjoyed meeting Crescent and using her Passionate Vegetarian cookbook, so I would love to win her cornbread cookbook and discover even more ways to enjoy cornbread! I'd love to try homemade cornbread. I've been reading your comments and anything that goes with butter, which most of you seem to recommend, is good with me! Up here in snowy WI, we don't hear to much about cornbread. Might be time to change that! I totally heart cornbread. My husband makes the most delicious blueberry cornbread. Warm with butter- well- a little slice of heaven!! Here's to more yummy cornbread for everyone! I would love to have a cookbook recommended by you. I am a Missouri girl living in AZ and I love reading about your Missouri adventures. 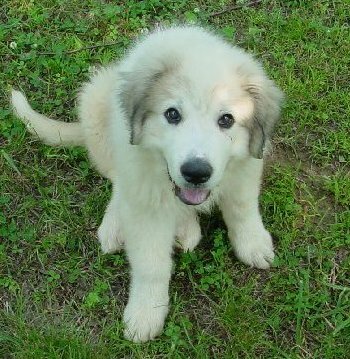 Plus I am an animal lover and follow all of your critters closely. And yes, my fam loves cornbread. I love warm cornbread with butter and honey but so far I've yet to find the perfect recipe. I made one once that was soft and just dripping with butter but it was far too rich for anything but a special occasion (this was baked on the occasion of the birth of a first child to a very good friend.) I am perpetually looking for a good recipe - crispy edges but soft crumb. Good corn flavor. No additional ingredients like bacon. I'm salivating just thinking about it. Mmm... cornbread is one of those things I could happily live on for the rest of my life. I love all kinds, especially my mom's. Cornbread with honey. Cornbread with hot butter. Both very, very good. I can eat it on the side of chili or other stereotypical accompaniments, but I'd rather just sit down with the pan and hurt myself. Hm cornbread. Yum, Yum, Yum! I use to waitress at the Buckhead Diner in Atlanta, GA and they were known for their cream cheese and japleno cornbread muffins. Drool. You've just gotten the pregnancy hormones to kick in and I must have the muffins. I wonder if I can talk the hubby into going there tonight. That said, I am absolutely loving reading all the Comments from your many readers - they are all delightful! Don't you just love that as of now there are 138 Comments??!! - your readership is vast and I'd say it was safe to say that we love your blog. This is such a fun 'giveaway' - thank you and congratulations to whoever (or is it whomever???) wins! One of my all time favorite foods has always been cornbread. As a little girl, I was not allowed to have any bread until I ate my meat and veggies. Since I was a very slow, picky eater, I was always worried that all the cornbread would be eaten before I finished. One time Daddy watched me out of the corner of his eye as he reached over and picked up the last piece of cornbread. I never say anything, but two fat tears quietly streaked down my face, and when Momma asked me why I was crying, I said, my voice choked with tears, "D-d-daddy tooked the last p-p-piece of cornbread and he knows I c-c-can't have any til I'm finished eating." Then Daddy gave this big laugh and put the cornbread on my plate and told me I didn't have to finish the rest that night, I could go ahead and have my cornbread. One of my favorite bedtime snacks to this day is cornbread and milk. Crumble the cornbread in a bowl and cover with milk, just like cereal. I still love that. Cornbread with whole corn, a good dose of WI cheese, and a dollop of sour cream next to a bowl of steaming chili- please realize that we have had below zero wind chills for 24 hours and most folks' car doors are frozen shut. Cornbread...it substitutes for sunshine in WI right now. Ooooh, yum! What a fun book! It's mainly cornbread with butter & honey, here, & a person simply can't have chili without it! I think, judging from comments, that I need to check Amazon our for Crescent's books. I already posted my cornbread recipe and its accompanying story on my blog---check the recipe index for the link to the post. I'm a former yankee who's been living in the south for about 6 years now. I moved from Baltimore to South Carolina, and then even further south to Georgia. While I was in college in south Carolina, I got my first waitressing job working at a "meat and three" restaurant. Meat and three's are a southern tradition. You pick your protein (be it fried chicken, fried steak, or chicken fried steak), and then your three "vegetables" (and I use the term loosely because mac and cheese, mashed potatoes, squash casserole and fried okra all count), and the whole thing is served up with a soft yeast roll or a warm mess of cornbread. The cornbread in this restaurant was my first experience with a real skillet, southern-style cornbread. I fell in love with the crisp golden crust and the buttery crunch when you bit into a piece still warm from the hopper. I would smother it in blackberry jam or honey, or use it to sop up the juice from my collard greens. I think it was that cornbread that finally convinced me the south was where I was meant to stay. Now I have my own cast iron skillet and I make cornbread at home all the time, but I'm always looking for new recipes to try. Growing up, Cornbread to me was always pretty sweet, more like a cake than a bread, but I've come to appreciate the crumbly, crackly texture of southern cornbread even more. So call me a Carolina Girl or a Georgia Peach, but either way I'm cornbread crazy! Being an East Texan girl, (now living in Oklahoma), I grew up on pinto beans and cornbread!! Would love to have the cookbook!! I love sweet cornbread and jalapeno cornbread. I have made them from scratch for years now. My mother always made cornbread with a big pot of ham and beans, which I loved , even at an early age! Sweet cornbread with butter and honey; is there anything better? Yum! My husband loves cornbread and usually make it every week. I am very boring, just using the recipe on the container. But this looks like it would be a good investment for me since I love to cook. Cornbread! I would love this book and the contest ends on my birthday! My mom grew up in a very rural area of Mississippi and my grandmother picked cotton for a very little amount of money. My grandmother had 11 kids and lost her husband when the youngest was 1. Sometimes when there was no meat for dinner, my grandmother would make Chicken Flew. When asked where the Chicken was she would say he flew away leaving only the cornbread. I grew up on cornbread and have many fond memories of my mom and grandmom making this in our kitchen. Here's a story: my sophomore year of college, I befriended a freshman girl who was actually LOSING weight in college because the dining hall food was...just not up to par. I persuaded her to come visit me and whipped up a batch of cornbread for her. That started a tradition, and many more times after that she would devour cornbread from my kitchen. Slowly she returned to her pre-college weight...and then actually gained more, as any good college freshman should. I called her recently (she's a senior now) and she told me that the legacy continues! Feeding people cornbread is apparently a handy way to make friends! I love cornbread made simply with just self rising cornmeal, some fat and buttermilk and made in a cast iron skillet. Serve it to me with a pork roast, mashed potatoes, sauerkraut, and whole green onions and I will think I've died and gone to heaven. To fancy it up a bit this is the recipe I used. I made this for my kids (four boys) when they were all home. grated cheese for the top. Mix all ingredients together and bake for approx. 1 hour at 350 degrees. I had a big deep round casserole dish that I made it in. Sure was good. When I first met my husband's family and we had cornbread for the first time together, I watched in amazement as they all shoved their slice in a glass of milk! Now, our young daughters do the same, and I'm still the only one in the family who eats my cornbread with butter and honey! The cookbook looks great and it would get lots of use at our house! The best cornbread I ever had was at a restaurant -- served still warm and in the skillet, with maple butter alongside ... 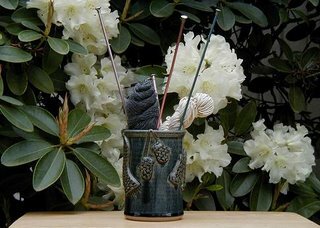 I need to learn how to make something like it! I'm so glad to learn about this book and will have to get my hands on a copy of it somehow! We're not vegetarians but Crescent's The Passionate Vegetarian is one of our mainstay cookbooks. We make the Oven-Browned Spudlets from it all the time ... in our cast iron skillet! I loved my Grandpa! He taught me a fantastic shortcut for making cornbread (Cotton Picking packets with buttermilk instead of water), he seasoned me my very own cornbread skillet when I got married, and showed me the treat of eating crumbled cornbread from a cup of milk (buttermilk for him - white milk for me)as a pre-bedtime snack the summer I lived with him while doing an internship in college. Because of he and my Grandma, I love cornbread (they are not with us any more), but just seeing the book and hearing the word "cornbread" instantly brings back great memories of them both. What a fun contest! Now I'm off to go back and read all some entries. I make my cornbread with stone ground white cornmeal from a local mill in my grandmother's cast iron skillet. No sugar, buttermilk or whole milk yogurt thinned with a little milk and melted butter. Being a born and bread Southern girl. I was literally raised on cornbread every night with supper. My grandmother made the best cornbread I have ever tasted. Her secret for a delicious brown cripy crust was to place the Crisco in her well seasoned skillet and heat them in a 425 degree oven before pouring in her batter. Thanks for offering such a wonderful give-away! I quit trying to make cornbread, I just cannot compete with my mother in laws cornbread. Maybe if I win this book, I will come up with a better recipe than hers. I have recently eaten my first cornbread salad. Ohh it was so good. I grew up eating red beans and cornbread. Times were tough back then for our family. Today, I make my family corn bread and beans and they love it! My mom always used her cast iron skillet of course. My favorite variation on cornbread is Mexican cornbread. It is made by adding green chilies, onions, and cheese to the regular batter. Yum! Having grown up in the South, I was raised on cornbread. . . cornbread dressing for Thanksgiving and Christmas dinner or wonderful warm cornbread slices with melted butter with fresh vegetables. I am also a fan of Crescent and own one of her big cookbooks. I enjoy reading it as much as I do trying her vegetarian recipes. I've enjoyed following farmgirlfare for several years - even before the Cary era! Love your recipes, stories and pictures of farm life. Your Autumn Soup recipe (with red bell pepper and yellow squash) is a big favorite of mine. I love reading your blog and seeing all the great photos you take of your farm, animals, and food. I would love to have this wonderful cornbread cookbook because cornbread is very much loved by the men in my family. I thought there was possibly going to be a fight at Thanksgiving over a pan of cornbread (cooked in a cast iron skillet, Thank you very much! Is there any other way to cook cornbread?!) between my husband, dad and one of my brother-in-laws. They are great fans of cornbread. Hot with butter or crumbled and eaten in a glass of cold milk will work for any of them. Thank you for sharing your farmlife. Cornbread is the ultimate comfort food for me. When I was a child my family had a very secluded, rustic cabin on the lake. We spent nearly every weekend at that cabin for many years. I have lots happy memories of days spent waterskiing, fishing with my dad, and evening meals of fried bass, fried potatoes, and cornbread. To this day, the smell of cornbread reminds me of my fondest childhood memories and takes me back to those simple, carefree times. Ok, I had NO IDEA Crescent Dragonwagon had another book coming out! Her Sizzlin' Skillet Cornbread (from Soup & Bread) is my alltime favorite cornbread. I've been known to double the recipe to fill my giant cast iron skillet right to the rim whenever we have chili get togethers with friends (and then the cornbread always gets raves). Thanks for cluing us in on a new Crescent book! Homemade split pea soup with cornbread is a staple around here.If I feel like splurging I'll add a little bit of cooked crumbled bacon to my cornbread batter. I LOVE cornbread. I eat it with butter, sometimes for "dessert" breakfast with honey. Most of the time with Chili. YUM! I really need this book. Our local stores no longer carry the Jiffy brand and I don't know where to turn! Cornbread with bean soup is how I grew up eating it in Missouri. Than I married & Moved to Wisconsin where they put syrup on it, took me several years before I tried it that way, have to admit its good. I like a sweet cornbread. And nothing beats cornbread with chili. For a girl of Jewish descent who grew up in San Francisco, my love of cornbread is immoderate. For some reason (neither ethnic nor geographic) my go-to meal for my family is beans and cornbread. But I make cornbread anytime I think my family is going to be less than excited about the vegetarian suppers I prefer to eat. I can make just about anything as long as there's cornbread and honey on the table. Crescent Dragonwagon is one of the cooking voices I hear in my head--along with Nigella Lawson and Deborah Madison, and sometimes when I'm impatient with myself, Mark Bittman. I love her writing and haven't read The Cornbread Gospels yet. I am a southern girl trapped in upstate New York and it has been an age since I had good corn bread. If I win I promise to make corn bread every day for a week to celebrate. I always make my cornbread in my trusty iron skillet. Mmm, delicious! Consider me entered in the contest! I think I could scare up a cast iron skillet if the book shows up at my door. Oh I would love this book! The last time I made cornbread it just didnt turn out well. Can not find this book in my library. Btut that bread on the page looked good! I would love to win this cookbook because I received a 10-inch iron skillet for Christmas last year and have not used it once because I have no idea what to do with it! Sliding in just before the deadline! My only "cornbread memory" is of that horrid stuff that comes in a blue and white box for a ridiculously cheap price at the grocery -- I think it's like 35 cents or something. Mom used to make it with her chili, which was outstanding. I never understood why we were expected to choke down this dry, crumbly mess with a delicious bowl of spicy, savory chili. I used to crumble mine over the chili just to make it disappear. ick! I'd love to learn more about the real thing! So, I made some cornbread a month ago and being me, I thought I'd try to mix whole wheat flour with the all purpose flour. The cornbread came out tasting great, but it was so crumbly my husband and I had to eat it with a spoon! I'd love a copy of the book. Just thinking about it makes me want to go home and make up a big skillet of it. i love cornbread with chili. perfection. *I have a 50 pound bucket of corn. *I have a grain mill that I love to use for fresh-baked breads. *I have lots of cast-iron skillets waiting to be used for just such a time as this. Holy corn! I'm commenter 181? What is there left to say? I love me a good corn bread with juicy bits of corn kernels on the inside. Good luck, everybody! I could use a copy of The Cornbread Gospels because I don't have a really good cornbread recipe, and I need something else I can make in my grandmother's cast iron skillet that she bought in 1932! mmm...cornbread. I never use the same recipe twice...and often improvise...sometimes comes out yummy moist awesome....on occasion dry....I guess I'll need to read the book to get my cornbreading on the right path! We always cook cornbread in cast iron. Cornbread Casserole: corn, cream corn, corn bread, sour cream and butter. Is there anything better? Cornbread rules have been passed down through each generation in my family. Its not like anyone ever wrote them down or even spoke them out loud. But to not follow the rules, well...it just wouldn’t be cornbread without them. Rule #1 - Use buttermilk in the recipe. If you don’t have buttermilk, then you need to make sour milk first by adding a splash of vinegar or lemon juice to regular whole milk. This is only a last resort solution, because it’s never quite as good as using real buttermilk. Slather with your real cornbread, with real butter, and serve with beans. I absolutely love skillet cornbread. My Uncle Harry gave me my favorite recipe, which I make and adore. But I ordered a copy of this book and look forward to trying the recipes. Thanks for the recommendation! Thursday Farm Photo: Bottoms Up!